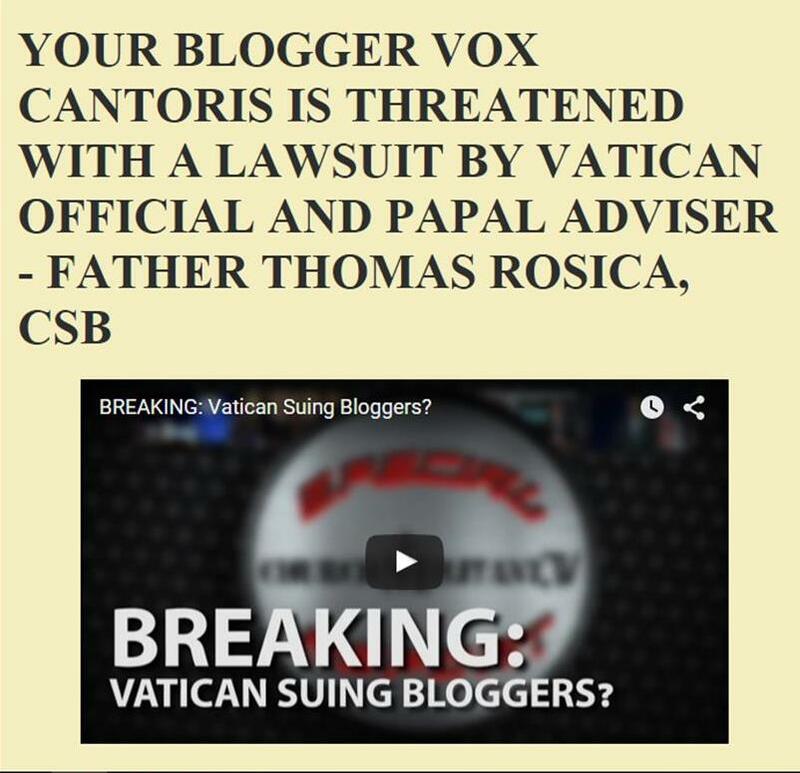 Vox Cantoris: Is "ad orientem" to be the norm? Is "ad orientem" to be the norm? From the 1920's, "liturgists" began experimenting with the priest at Mass facing the people and above are three examples from the 1950's to highlight the traditional Roman liturgy being celebrated in this manner which by 1966 was the norm in Canada, the United States and most other places. Of course, this has been seen to be the "norm" everywhere since the promulgation of the new order of the Mass in 1970 and many will agree that it is the single most damaging aspect to the Mass in either Form. The The priest has become the showman, he is no longer seen as "another Christ" re-presenting the Sacrifice of Calvary, but a Presider over a Supper and as Pope Benedict XVI in the Spirit of the Liturgy wrote, we are now a community "turned inward on ourselves" instead of being focused on the LORD and His propitiating sacrifice. 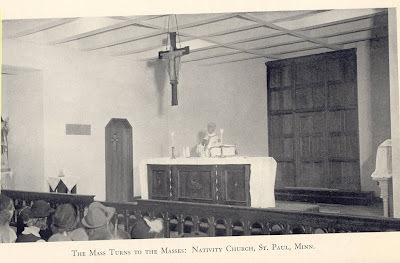 In the Third Roman Missal, in two places; at the "Pray brethren (my brothers and sisters)" and at "May the peace..." the priest is instructed, "facing the people the priest says...". If the instruction is to "face the people" where then does the Missal presume the priest if facing? Cardinal Canizares, the Prefect of the Congregation of Divine Liturgy and the Discipline of the Sacraments has been quoted in Zenit as saying that the "The Council did not speak of the priest celebrating Mass facing the people, that it stressed the importance of Christ on the altar, reflected in Benedict XVI's celebration of the Mass in the Sistine Chapel facing the altar. This does not exclude the priest facing the people, in particular during the reading of the word of God. 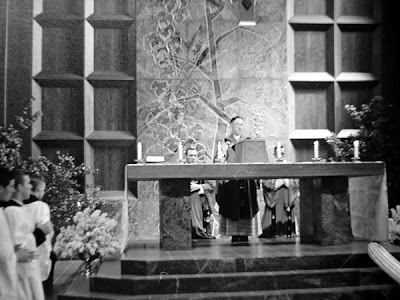 He stressed the need of the notion of mystery, and particulars such as the altar facing East and the fact that the sacrificial sense of the Eucharist must not be lost." Speaking at a conference on liturgy at the Spanish Embassy, the Cardinal confirmed the publication soon of an Instruction for priests and laity alike on the celebration of and participation in the Mass. "We are preparing it, I hope it will come out this year, in the summer," according to Zenit. As a middle way, Pope Benedict XVI, in the same book previously referred to wrote of what we now call the "Benedictine arrangement" of six candles and a crucifix on the altar between the priest and people to focus everyone, especially he priest, back on Christ. The reality is, this is not being implemented. Perhaps then the Holy Father and the Prefect realise that the example is not going to be followed and that what is going to be necessary is Instruction. Are we seeing then the beginning of new liturgical movement to address this matter? Will the the Congregation order this with an implementation period of perhaps five years for all altars to be moved or reconstructed to face literal or liturgical east and the priest will no longer face the people. In the meantime, will the Benedictine arrangement be mandatory? Let us pray that this becomes the norm and that the indication of further work in sacred music and architecture are also high on the agenda. One of the great problems with the GIRM is that a priest can stay technically within the rubrics, yet say a sloppy Mass. The various "indults" have to stop. Communion in the hand, bread distributors, and altar girls are, in my opinion, an abomination. I doubt the Benedictine arrangement will be mandatory, since it's not liked by either conservatives or liberals and the bulk of priests who are neither tend to go with what won't get them in trouble with their superiors, the public, and their peers. If the perception that the public wanted ad populum, their peers all submitted and wanted everyone to conform, and their superiors either abandoned them or were advocates of ad populum, I doubt ad orietum would have been abandoned. If ad orietum is to return en mass, public pressure must be low, peer pressure must be low and isolated to the liberal fringe, and strong support must be given by the bishops. That happened with the new mass translation, which is why despite all the liberal threats of outright rebellion, they were accepted even by liberals. If all that happens is a strongly worded advice booklet, I'm sure priests in more priests in Churches that actually look like Catholic Churches will attempt ad orientum, at least on holy and solemn days and some bishops might actually mandate ad orientum at least on holy and solemn days. If popular and peer pressure isn't too great, that'll get expanded and will become the norm, especially if pressure from the Vatican continues. But it'll take time (20-50 years). But given the Pope's history, his style seems to be one of giving the Church many chances to go on track before using stronger measures a few years later. It's happened with SP, UE, the LCWR, and other cases. If the current Pope lives long enough, the contents of the booklet mentioned in Zenit will become mandatory and the Church will finally be fully on the way to exorcising the demonic "Spirit of Vatican II". The Bishops, by and large, are a "monkey see, monkey do" lot. If it becomes fashionable to offer Holy Mass ad orientem, then they will, one by one, start to offer Mass that way. But the Holy Father has to lead the way. Once a year or so in the Sistine chapel just doesn't cut it. Of all the liturgical lunacies spawned by Vatican II and the New Theology, the versus populum of the priest has to be the most destuctive.